Paint packages such as Electronic Arts's DE-GAS Elite and Atari's Neochrome have done well and have been used to create a remarkable variety of art. These packages have one major limitation however: They can create only graphics with the same resolution as the screen. DEGAS Elite thus has a limit of 640×400 in monochrome mode, or about 80 dpi. Most printers are capable of higher resolution however—from about 100 dpi for inexpensive 9-pin dot-matrix printers, up to 300 dpi for laser printers and the H-P Deskjet. There is a popular file format, an "image" file, which supports such high resolutions. These files generally have an extender of .IMG and can be in virtually any resolution. Most desktop publishing packages, as well as Migraph's Easy Draw, can import and use .IMG files. However, except for a few scanners and some commercial clip art, there has not been any source of .IMG files, and no way to edit the few that were available. That has all changed with the introduction of Touch-Up, the high resolution graphics editor from Migraph. Touch-Up's main screen consists of a working window, a tool panel on the left side of the screen and a complete set of drop-down menus. The working area shows the graphic you are working on. Since the resolution of the graphic can be far higher than what can be shown on the screen, Touch-Up compensates by showing the graphic larger than full size, and the graphic can cover many screens, provided you have the memory available. The working area can be scrolled just like any window, using the scroll bars to reach the part of your picture you want to work on. You can also scroll by clicking and dragging the "locator," a black box that represents what you can see on the screen within a white box that represents the whole graphic. The tool panel is normally fixed to the left side of the screen, but it can be hidden to provide a larger working surface or detached into a window of its own, so that it can be relocated on the screen. It is often advantageous to hide the tool panel, since many of its functions are duplicated in the drop-down menus. As is normal for such programs, all drawing is done with the mouse. A variety of drawing tools are available, including box, circle, polyline, arcs, freehand sketch and splines. Upon selecting the box or circle, a box or circle appears instead of the mouse cursor, in whatever was the last size you used. You can resize the brush by moving the mouse with the left button pressed. The brush moves with the mouse until you press the right button (as in Easy Draw) to paste the brush down. When the brush is pasted down, it is then drawn with the current line style and fill. Splines are an interesting and powerful tool. A spline is a curve that attempts to follow a series of control points, which you lay down by clicking the mouse's left button. Before transforming the spline into a brush, you can edit the control points (remove or move them). Once you have created a brush with the spline, you can still edit points, using the keys and mouse. Even the &"goodness of fit" (how closely the spline tries to pass through your specified control points) is user-adjustable. Special-effect and user-definable settings abound in Touch-Up, The line width and end type (arrows or plain), as well as whether edges are drawn for filled shapes, can be set. Eight different shadow offset directions can be chosen, and the offset for the shadow can be selected as well. Four different "writing modes" can be used to create some special effects: replace, XOR, transparent and reverse transparent. All 36 GEM patterns can be used for fills; however, there is no user-defined pattern. Four zoom magnifications are available ranging from full (you can see the whole page represented on the screen) up to four times normal. Touch-Up's "lightning" mode gives you access to only the currently visible screen (no scrolling to other parts of the diagram). However, any changes you make in lightning mode are automatically transferred to the main diagram when you exit. There are quite a few advantages to working in the lightning mode. First of all, there is an Undo feature, which is missing from the regular mode (and sorely missed). You can Undo the last action or all changes made since entering lightning mode. Then there are the additional drawing tools. An airbrush is available, which can be square or circular, in one of three sizes. The maximum saturation of the brush can be set, as can the fill speed. You can also decide to use the current pattern for the fill. Another new tool is the "fat bits" mode, which provides a small portion of the screen in extreme magnification, so that you can work on individual dots. Lasso is another useful tool. With it, you can lasso just about any portion of the picture and start using it as your current brush. The resizable clip rectangle provides still more options. Once it has been specified, it allows you to move or copy whatever it surrounds to another place in the diagram. Its contents can also be saved to and loaded from disk, providing a rudimentary clipboard capability. 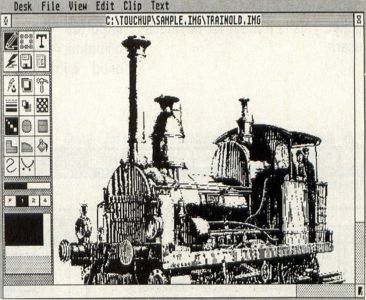 Besides using .IMG files, the clip area can be saved as a DEGAS, MacPaint, GIF, PCX, TIF or IFF-ILBM files. You may load most of these files into the clip area as well. A utility provided with Touch-Up can convert PrintMaster files to .IMG files and back again. Thus, Touch-Up can edit and save Print-Master files—a significant plus. The clip area can also load .GEM files from programs such as Easy Draw, unfortunately, the text is not loaded, and therefore is lost. This is too bad because many .GEM files include text. This is rather a serious limitation. The contents of the clip rectangle can be mirrored, flipped, slanted and rotated. Three other special effects are also available—Cleanup (removes stray dots), Outline (removes fill patterns, leaving just the shape outline) and Mask (creates special effects using fill patterns, generally to lighten them). Finally, you can use the image viewer to look at any .IMG file on the disk without loading it, and even set the clip rectangle to be the proper size so that you can then load it without distortion. Touch-Up does text. It comes complete with ten special fonts, all of which can be set to be any size from too small to read up to 999 dots (not points) high. Various attributes, such as underlined, bold, slanted, italic, fat, outlined and filled can be specified. Filled is especially powerful, since the letters will be filled with the current fill pattern. Using text is somewhat awkward however. You must specify the size and attributes, then click on an icon that lets you type up to 35 characters into a dialog box. Once you have done this, you move the cursor onto the drawing area and click the left button, which will bring up a box that is roughly (very roughly) the size of the text string. Clicking the right button then pastes the text down and draws the letters. It's not a word processor, but it does work. Although Touch-Up produces only black-and-white pictures, it can import color pictures, converting them into black and white. There are a variety of algorithms you can use for this conversion, ranging from simple (quick and dirty) to 4x4 table mapping, where each color is mapped to a different 4x4 grid pattern. The latter takes awhile, and you can end up with a big image file (takes up lots of memory and disk space). The results are remarkable, however, especially at 300 dpi on a laser printer. Touch-Up is flexible when setting up an image. A dialog box allows setting the size of the image (in pixels, centimeters or inches), the size and location of the clip rectangle (although it's easier just to drag it where you need it) and the resolution in either dpi or pixel size. Unfortunately, the manual is incorrect on how to set the pixel size. You cannot simply type in the numbers you want and click on OK. You must first click on the DPI button (even if it is highlighted already) or your adjustments will be ignored. Speaking of the manual, in general, it's well written, although slightly disorganized. There are sections (as noted in the previous paragraph) where explanations are wrong, as if the person writing the documentation didn't get a chance to test it against the final product. There are also inconsistencies in the product itself. For example, when drawing boxes in regular mode, you get rounded corners by holding the Shift key. However, when drawing boxes in the lightning mode, you must press the Alternate-R toggle to get the rounded corners. Why should these be different? There are also instances where two similar actions are not selected the same way. Such anomalies are not serious, but are annoying, since you must drag out the (indexless) manual to try to figure out how to perform the task. Touch-Up's disks are not protected, and it runs just fine from a hard drive. However, Migraph has been hurt by piracy and so has taken the rather drastic step of providing a hardware "key" that must be plugged into the printer port. While some may be irritated at having to pay for such a thing (keys are not cheap, that's why many manufacturers do not use them), my reaction is that if this is what it takes for Migraph to continue to provide the excellent software (and this includes Touch-Up) they have in the past, it is a small price to pay. Touch-Up is a GDOS application and comes with several utility programs that are useful. First, there's OUTPRINT, which can print any .IMG file. It is the same program provided with Easy Draw. Since a small .GEM file must be present for OUTPRINT to work, you cannot print an .IMG file until it has been loaded into Touch-Up and saved again. As mentioned earlier, a program for converting PrintMaster libraries to .IMG files is also provided, which makes it easy to use PrintMaster icons in your desktop-publishing files. Lastly, a utility that speeds up your mouse is included. Touch-Up is completely compatible with G+Plus from CodeHead software, but is not compatible with Turbo ST from Softrek (Turbo ST fouls up the flip and rotate functions of the clip area—at least). Touch-Up is a powerful drawing package that can handle .IMG files, as well as many popular graphics formats. Because of this power, you will need to spend some time learning to use the program, but the time spent will be well worth the effort. This program is highly recommended. 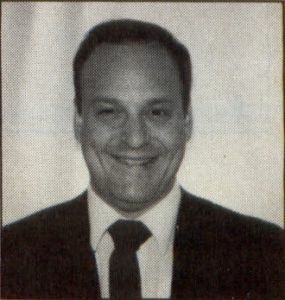 David Plotkin has been pounding the keys on Atari computers for almost ten years, and in that time he has written many memorable programs and articles. He has an MS in chemical engineering and is a data analyst for Chevron Corporation.